After approximately 4.5 Billion years of tectonic activity and land formation, Enderby Cliffs has finally seen a first ascent. Done by Lyle Knight and Marc Piche. The following text interview was done by The Morning Star asking local experienced climber, Lyle Knight, about this incredible first ascent. How do you know that it has never been climbed? Has it ever been climbed in the summer (minus the ice)? 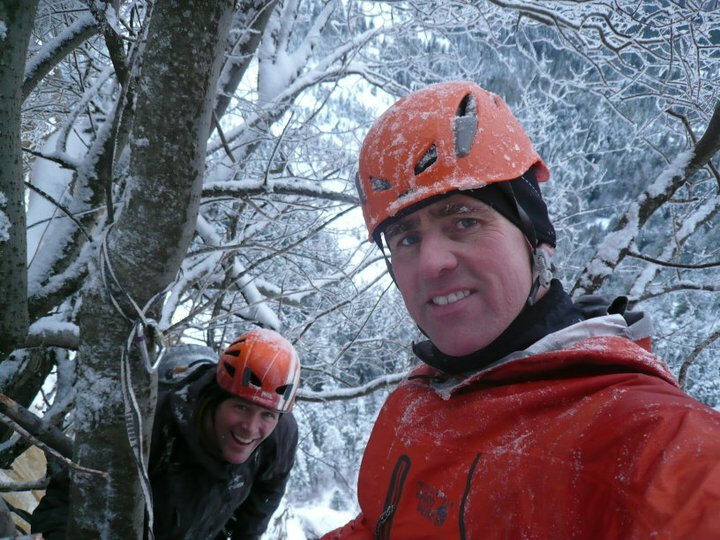 The ice climbing community in BC has been, and remains, relatively small and close knit. I have been in contact with Rick Cox, an Armstrong ice climber who have been keeping an eye on the feature for upwards of 30 years and has made several attempts at the route with various partners, see Rick’s comments below. Also, if someone were to have climbed it in the past, it is likely word would have passed through the community. Also, most significant ascents are reported to the Canadian Alpine Journal as the central reporting mechanism. There have been a couple of attempt to climb the wall in the summer as well, however the rock is very loose and dangerous and parties have rappelled from the wall after climbing up only a short distance. 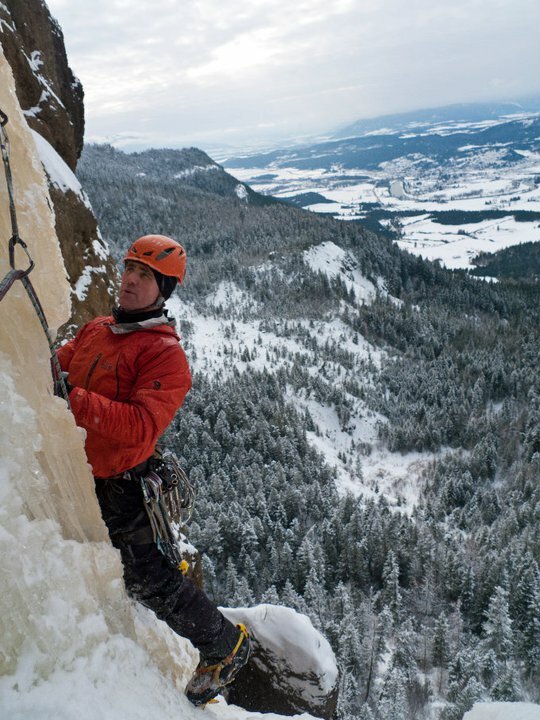 It’s somewhat ironic that it’s safer to climb Enderby Cliffs in the winter on ice. Why do you think no one has ventured onto this route? One main reason would be the lack of proximity to ice climbing centres. Places like Canmore, Banff and Golden are populated by folks keenly interested in climbing as that’s where the resources are located for recreation and guiding. Therefore, there’s a good supply of people in those areas looking out for these features (ice climbs) and there’s lots of partners to tap on the shoulder when you want to go climbing and attempt routes like Mythologic. Not so much in the Okanagan valley. 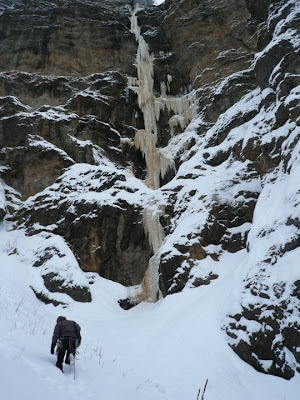 By my estimate, there may be less than 20 active ice climbers living in the Okanagan Valley and a small percentage of those climbers would be interested/ capable of climbing Mythologic due to the difficulty of the climb. The other main reason it hasn’t been climbed to date is the location. There is a very short window of opportunity most years to climb the route as it is exposed to the afternoon sun. Also, the route lies between 850m and 1000m above sea level and the temperatures in the Okanagan are quite moderate so it breaks down quickly following a cold snap. Therefore, it took lots of monitoring over several years to find the right window, which would be difficult to do if you didn’t live in the area. Also along this vein is access. It’s approximately 2.5 hours hiking to the base under good conditions and it takes some research to find the best approach. 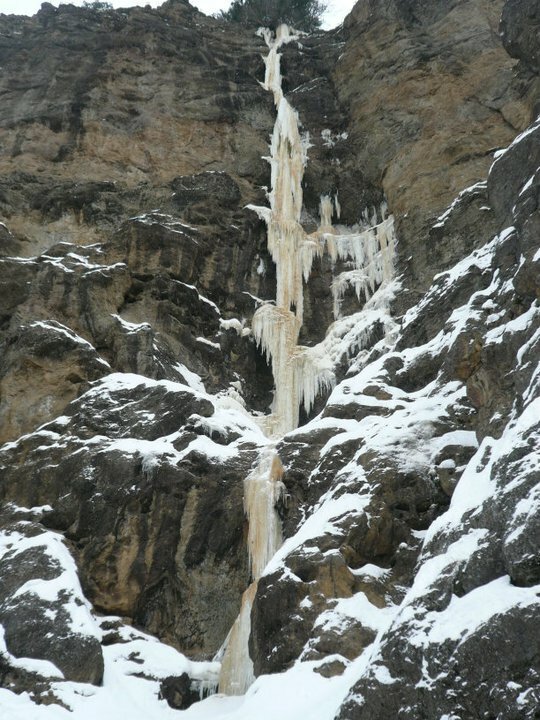 Ice climbers travelling through the area and noticing the climb would have to commit considerable time and effort to the project, to determine best access and monitor conditions for the right window of opportunity. When you bring together all of these factors it came down to being in the right place at the right time with the right knowledge. “I have been living and climbing in the Okanagan valley since 1983. 'Back in the day' other than myself, there was virtually no one seriously interested in shall we say, more 'serious' ice climbing. I have made a number of forays into this waterfall over the years, but for various reasons was never able to do this climb. The last time I was up there, was about 12 to 15 years ago. We were a very strong team, consisting of Court Ashbaugh of Vernon, Cary Jaeger of Revelstoke and myself. We soloed the first grade 3 pitch then roped up for the next pitch, which ended in a cave. At this point we were turned back by a torrent of water that was cascading down the climb. We (I) could never quite seem to get all the stars aligned: good conditions, the right partner, up early enough etc. How did you learn about this route and why did you decide to tackle it? When we moved to the Okanagan Valley in 2003 I didn’t know any local ice climbers and would meet up with friends in the Rockies on ice climbing trips. 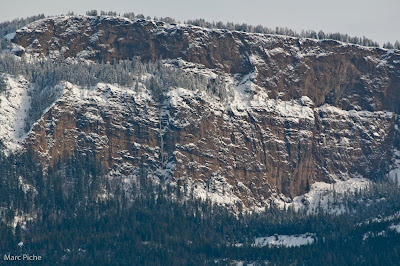 This meant I drove by Enderby Cliffs and watched the ice form and disappear over numerous seasons. Around 2006 I started packing my binoculars and found a good viewing location on the east side of the river. I started taking pictures of it through my binoculars so I could compare year to year how it looked at different times in the season (December through March). Typically the route is on the cliff face from December through February/ March. However, it faces west and the upper reaches of the climb get sun-baked later in the afternoon and the ice delaminates from the rock on the upper portions, especially where it enters the trees at the top. I ice climbed in the Malakwa area over the Christmas break and noticed through the binoculars the climb was forming nicely. I went out for a hike to the base on January 2 and confirmed that it was climbable and that I would need a technically strong partner to alternate leads with (each climber takes a turn ascending with the rope to the next belay). I knew Marc through mutual friends and that he would be the ideal partner for the route due to his experience and fitness. Why hadn't you done so before? As above, the climb really needed to be in ideal conditions. This meant a month of temperatures below 0C, some daytime warming is okay to consolidate the icicles and the long cold nights associated with the longest nights of the year. In addition, it was predominantly overcast through December so the climb hadn’t broken down much due to the sun effect. Marc was heli-ski guiding north of Revelstoke until January 9 and came out that evening to climb with me on the 10th. I guess another factor was I didn’t know the best access to the area before hiking the Enderby Cliffs Provincial Park trail the previous summer. When I hiked in on January 2 it was apparent the trail was being used by snowshoers and trail runners as it was nicely packed in." For an excellent article written by Lyle Knight covering the route itself, follow this link to Gravsports-Ice and read this exciting article. All photos taken from the Lyle Knight collection posted on Facebook.